Get on the web from your computer. From your phone. From your car. And now, thanks to Sony, from your camera. They’ve launched the first camera with a web browser, which will allow you to upload your photos straight to your favourite photo sharing site, in the style previously only covered by the Eye-Fi card. You have to go via Sony’s own photo sharing site, but they promise that this only makes the process easier. The camera itself packs 10 megapixels, as well as a not-to-be-sniffed-at 4GB of internal memory. 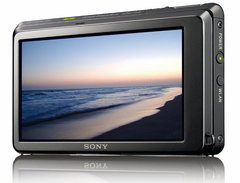 Being Sony, you’re also bound to see Smile Shutter, Scene Selection and the like. And now the bad news – there currently aren’t any plans to bring this to the UK, which is somewhat disappointing. It seems we’re still destined to be tethered to card readers and USB wires.